An individual development plan (IDP) is a tool that helps facilitate employee development. It’s a two-way commitment between an employee and their manager on what they are going to do to grow. IDPs are often used as a way to drive leadership development. Organizations like them because they are visible, tangible evidence that leadership development is taking place. They can be monitored and tracked as a measure of progress, used as a way to drive accountability for development, and most importantly, if they are well written and taken seriously, they really do work. I’ve written about the importance of written individual development plans (IDPs) for leadership development, and how to develop your leadership skills, but not how to actually write one. I’ll draw on my experience from having helped hundreds of leaders write IDPs, using them for my own employees, as well as my personal experience with my own IDPs (rule number 1: if you’re going to help someone else write an IDP, you’d better have current one yourself). 1. Start with a goal; have a reason to develop. There needs to be some kind of reason to develop. If there’s no reason to improve – or no motivation, then there’s no reason to have an IDP. 2. Identify what you want to learn, or get better at. Identify the three most important competencies (skills, knowledge, attributes) that you want to work on in order to achieve your goal. If you’re new in a role, these will most likely be the unfamiliar functional areas that you’ve had little prior experience with. Or it may be getting to know your new organization or team. If you’re struggling in a role, these things may have been identified in your performance appraisal, a 360 leadership assessment, or feedback from your manager or a coach. In order to prepare for a new role, you’ll need to identify the required competencies for that new role that you don’t yet have. For leadership development, having access to a leadership competency model can help you identify the leadership competencies your company has identified as critical for any leader. You can either assess yourself, ask your manager for feedback, or ask for a 360 assessment. When I work with a leader, I’ll ask questions to get at the what and why. That helps me identify the competency, the reason, and the relative importance. People sometimes struggle to put a “label” on the need, so having that competency model helps us do that (“OK, so it sounds like you want to work on your leadership presence, or strategic thinking, or you need to improve your financial acumen – is that right?”). You might also want to identify your strengths. Strengths can often be enhanced and also be leveraged in order to address development needs. Sometimes, if you aspire to a larger role, the most important step in your development plan is to identify the role or roles to take in order to get you ready, often a lateral move. However, given that job changes are significant and don’t happen all that often, a challenging assignment is usually the best way to develop a competency or competencies. It’s those “stretch assignments” that force us to perform, learn, and have the most impact. The other advantage of a developmental assignment is that they combine real work with development. Otherwise, an IDP can become an “extra” thing to do when you have time, and of course, never gets done. Then, once that project is identified, identify people that can help you learn the new skills required to be successful with that project (the same skills identified in step 2). For example, if that new project is going to require you to lead change, find 2-3 people that are really good at leading change and go talk to them. An internal or external coach may be able to help with tough to learn attributes, like relationship building. A mentor can often help you develop political acumen, or organizational agility. Finally, identify any courses, books, or websites on the topics you want to learn from. 4. Assign dates, costs, and who’s responsible for what. The date helps you get specific and keep your commitment. Any costs need to be approved by your manager. While you’ll be responsible for most of your plan, your manager may have s few things he/she commits to doing to support you. 5. Discuss your plan with your manager. Although it’s possible to have your own plan and not involve your manager, it usually helps to get your manager’s feedback, involvement, and support. If for some reason you’d prefer not to do this (say, you work for a jerk, for instance), find a trusted coach or peer to talk it over with. By both of you signing the plan, it’s kind of a symbolic two-way commitment. 6. Implement the plan, follow-up often, and reflect on what you’ve learned. Keep your plan in front of you at all times. Check off those items you complete, you’ll feel a sense of accomplishment. Think about what you did, what you read, what you learned. What were the lessons? What should you incorporate as a permanent part of your repertoire? What should you reject? What did you learn about yourself? It’s often helpful to have a manager, trusted coach or mentor to help you uncover those “V8 moments”. What’s your experience been with IDPs? Would doing it this way be an improvement? Do you have any other tips to share? If you’d like to assess the quality of your IDP, see my checklist for a great IDP. Need some help becoming a great leader or developing your organization’s leaders? Contact me to discuss leadership assessment, coaching consulting or training. I no longer send out free templates. With the growth of my blog, the volume of requests got to be unmanageable. 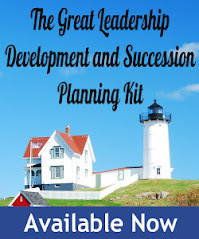 However, I’ve published an e-book, The GreatLeadership Development and Succession Planning Kit, which contains an IDP template and lots more. You can download it as a PDF from the above link for only $7.99, or purchase it as an eBook on Amazon, ITunes, and other outlets for the same price. Wise words, Dan. Is there a template? yes, available to current and new subscribers. If you are interested, just send me an email. Another reason why IDPs are great is because they give employees ownership of their own development. Instead of being told, "This is what you need to improve on," the employee is able to determine what they need to do better on their own. It's funny how more inclined people are to do things that they decide on, rather than being told to do something. Great post, Dan. You have inspired me to go down and look at some of my employee's IDPs. We require them to have one, but I haven't been looking at them. Perhaps when I do I will see that they are lacking many of the things you comment on. I like the "checklist for a great IDP" as well. Thanks much! Glad to inspire you! Thanks for stopping by. - and good to see a comment from Training Time too! thanks. Great post Dan! What I really like is that it empowers all of us (employees, managers, etc.) to take responsibility for our own personal development as opposed to waiting for our manager or HR to get around to it! Your site is very interesting and helpful for a young manager like me. I need to write an IDP for one of my leaders, it's possible to send me a template ? I'd be glad to send you an IDP template, but I'll need your email address. Please send me an email (see sidebard). Dan, I would love to get a copy of the template as well. Hi, I'm Isaac Yassar and I help people reaching success in self development, business, and blogging for free. Very interesting article Dan, I agree with you that IDP is very useful in employee / manager development. That shows the importance of self development, we need to be better before we can possibly achieve something better, such as a solid and sustainable success in career. Good job! What is your email address? I would like the template. can i have the template pls? I have just been assigned to a leadership position and have been told I need to develop a leadership development plan. Please, please may I have a copy of your template? be glad to , but you need to send me your email address. I'm at dmccart3 at rochester dot rr dot com. Hi Dan!))) Thanks for sharing such an interesting information! :))) Could you send me a template as well please? Yes, I would, but you need to send me your email. Hi Dan can I please have the template also. I have sent my email to you. I have not received your email. My email address is dmccart3 at rochester dot rr dot com. Are you familiar with trying something like this with front line (manufacturing) workers? I heard Markus Buckingham speak about working to your strengths a couple of years ago, and have read all of his books. He is a powerful advocate of understanding your strengths and working with your boss, colleagues to develop each role you have into something which is at least 60% time dedicated to tasks that you are strong in. Thanks for the plan! I would like to quote your ideas in my final paper for my leadership class. Reminder, I've stopped posting comments for requests for templates a long time ago, but will still respond to email requests. Sorry, but I'm no longer sending out IDP templates. Thank you so much, that was really helpful ..appreciate your time and effort in spreading good things . Very good waste of time, employees could have gotten something accomplished if it were not for these types think up this pie in the sky stuff to make them feel good all the time. I agree with Anonymous above. I am in my 50's and have worked at corporations for most of my life and have come to realize what a joke all of this annual review and self-development process is. Never been fired or demoted or "outsourced". I've "exceeded expectations and been a "solid performer", big deal...if there is nowhere to move and you don't want to be a manager what is the point? Eventually the size of the raises tapers off because you are far above the "mid-point" of your salary grade. Why make me do all of this improvement mumbo jumbo? Those who want to move up the corporate ladder are welcome to jump on the train, those of us who want to just be comfortable in our current job shouldn't have to. While all of this is great advice and outline for development and consistent with my well practiced managerial background, I am disturbed at what has been a shift in approach within the management world over the last few years. In my experience and training, the emphasis has drifted from the notion of a catered plan for the "individual" to a focus upon the individual as the only accountable party to development. A superior is by default the model and coach to a individuals development. A superior has achieved their position because they have achieved something that the subordinate is in line for developing. A superior "knows" the path, the strengths of the subordinate in the context of of the conditions. However, the subordinate is in their current position because they have not achived this level of acumen. That could be a matter of skills development but more likely is a lack of awareness in feedback of points to focus on. My point being, that development in the bubble of ones own assessment and without feedback and coaching is not conducive to a well executed Development Plan. Where's the partnership? I think what is missed here is that, there is a great deal of actual real life execution of training and subordinate awareness lacking in business than the author would realize. All of this is an endemic condition throughout business culture these days...managers don't really get out into the field and manage.